In mid-December, on the day after the climate talks wrapped up in Lima, Peru, the International Energy Agency, IEA, published an annual report on the coal market. Considering all the headlines about President Obama’s war on coal and the secretary of state, Kerry’s speech at COP 20 summit in Lima, Peru, committing to reducing emissions, the contents of the IAEA annual report were surprising. Now joining us to discuss the coal report is Jeff Biggers. He’s an American Book Award-winning author and journalist and historian and author of several books. He is also the grandson of a union coal miner in southern Illinois and a longtime chronicler of the coal industry. Thank you so much for joining us, Jeff. JEFF BIGGERS, JOURNALIST AND HISTORIAN: Thanks for having me. PERIES: So, Jeff, the IEA stated that the coal use worldwide would continue to grow by more than 2 percent a year through 2019. What do you think of this report? BIGGERS: I think it was for the most part spot on. I think this is the best of times and the worst of times for the coal industry. While we see certain moves in the direction toward renewable energy and certain commitments by various governments in Europe and around the world, including our own, to shift away from the consumption of coal, I think we’re seeing this other market that continues to grow abroad. And I think that’s part of the narrative that we really need to be understanding right now is that it’s still a very volatile coal market that still continues to grow and we’re still far off from any kind of war on coal that we often hear about in the headlines. PERIES: So what is this kind of schizophrenic behavior on the part of the U.S. administration in terms of making some commitments internationally? By this I mean when Obama went to the AIPAC summit and the deal he made with China and announced all these emission cuts. And also we found Secretary of State Kerry at the COP 20 making a very compassionate speech about needing to reduce emissions and making a commitment to climate change or changing climate change. What do you think of these contradictions? BIGGERS: Well, I think we’ve really had a sort of a Dr. Jekyll, Mr. Hyde approach to the coal industry the past six years. Obviously, in the last few months we’ve seen perhaps a different side of the Obama administration willing to come to terms with having some sort of climate agenda. Of course, we’ve seen the initiative now. They’re taking on the ozones. A long time ago they had made some sort of commitment to cracking down on mercury emissions. But I think later on this year we’re going to be seeing likewise a better commitment in terms of cracking down on carbon emissions. But the truth remains is that we still have a vibrant coal industry that has largely a foot in United States. 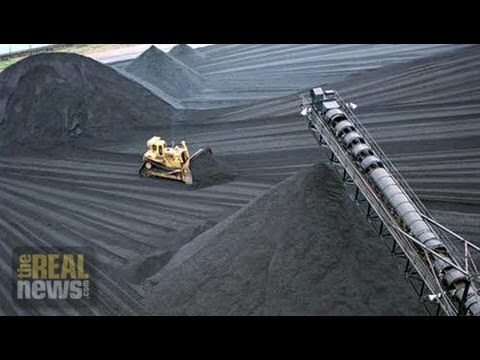 And if they’re not only providing the coal for our domestic use, we’re now loading it up onto our barges and shipping it abroad and beginning to see, really, a burgeoning coal export industry that is feeding these markets, especially in Asia. And I think that’s something as Americans, as people who are looking at the global context of this energy issue, really need to be aware of, that perhaps we’re moving in the direction of renewable energy in some states, in very few states. At the same time, through the backdoor we’re seeing really the beginnings of a much larger coal industry going abroad. PERIES: So, then, how are they going to achieve the kind of commitments they’re making internationally in terms of carbon emission reduction by fifty-fifty [sic] or what’s ahead in terms of commitments in Paris at the end of next year? BIGGERS: I’m not really sure. I think we want to be try to be optimistic, what we see now is an incredible drop in prices of various renewable energy options. For example, in the solar industry, you’re seeing now that panels have dropped dramatically and photovoltaic use now is really on the rise anywhere in China and in other countries. And so you see that kind of commitment is happening. You have countries, of course, like Germany, which has really put on a full-court press now of trying to accelerate their transition to renewable energies. Earlier this fall, we see releases out of Germany that on a particularly hopeful day, that nearly 60 percent of their electricity came from either solar or wind due to the decentralization of their electricity sources. So there are some hopeful glimmers out there. I think largely it’s because the market is shifting toward renewable energy. And I think that’s ultimately what is going to be driving much more than any kind of global climate commitments. PERIES: So some people were speculating that this mechanism of carbon caption [sic] is a possibility in terms of reducing emissions long-term. What do you think of that technology? Or does it even exist? BIGGERS: You know, I think that’s still a great question. It’s still a very experimental. Carbon /ˈkæpʃənsi/ and storage, what we call CCS, is still in very nascent stages. We actually can’t say that there’s any power plant, coal-fired power plant online that’s capturing its carbon emissions on a market level. You have a lot of experimental plants. One plant, of course, in particular, is down in Mississippi, a plant that we poured a lot of our U.S. tax dollars in under the Obama administration with the idea they’re going to be using this lignite coal, which is a particularly dirty coal, out of Mississippi to burn and then capture the carbon emissions. What we don’t talk about, of course, is the fact that it’s extremely expensive. The plant in Mississippi cost over $5 million, closer to $6 million per plant, all these overruns. The other part of the dark secret of carbon capture and storage is that they have to use 20 to 40 percent more energy, you know, all the energy they used to actually capture and go through the process of storing these carbon emissions. And that means 20 to 40 percent more coal they’re going to have to be mining. And so, to me, that ultimately makes it even dirtier, even more destructive, and even deadlier as a source of energy than regular coal-fired plants. And I think that’s part of the discussion that somehow we’re leaving out when we sort of glibly say this is a potential clean coal plant. PERIES: Right. And, Jeff, the sliding oil prices, what impact does that have on coal? BIGGERS: You know, I’m not really sure what to tell you on that. Obviously, when you have the oil market plunging like it is and it has an impact on any kind of energy production. A lot of the power plants relying on natural gas and coal, of course, will shift back if there’s any kind of access to using petroleum products. I think in general it allows us as a country to sit back and not continue to push for renewable energy options. And I think that was what really concerns me is that if we have this sort of illusion that somehow energy continues to be cheap, we’re not going to pursue renewable energies with the sense of urgency that it really requires. PERIES: Jeff, meanwhile Kentucky senator/Republican Mitch McConnell, soon to be majority leader, has said that he is going to declare war on President Obama over coal. What does he mean by that, and what do you think of it? BIGGERS: Well, I mean, I think first we have to make it very clear that there is no war on coal. The coal industry in Appalachia in particular–McConnell represents Kentucky–has seen a tremendous decline not because of any particular war on coal, but because the market is just cheaper back in Illinois or in the far west. So we’re seeing a shift of the coal market, as opposed to any sort of war on coal. Right now the state of Illinois is in the throes of the biggest coal rush in nearly a century. And I think that sort of reality needs to come into a reality check of any kind of talk of war on call. I think in particular as we begin to report these issues we need to be very clear on how we use language, be it on a war on coal or even the use of clean coal. For example, I did put out a piece today on Al Jazeera saying we’ve been using the term clean coal since the 1890s. It’s a slogan from the industry. And yet now journalists glibly use that either to refer to certain sort of carbon capture and storage plants or to the industry in general. And we really need to call coal what it is. It’s a very dirty, a very costly, and a very deadly industry that still takes the lives of three coal miners daily from black lung disease and still results in a tremendous amount of destruction, both our waterways and air pollution. We still have the issues, of course, we haven’t discussed about coal ash, a whole gamut of destructive and very deadly aspects of coal that we nearly need to continually bring back into this discussion if we want to continue with this very old industry. PERIES: Which we will be doing on The Real News Network. So I hope you can join us for that discussion, Jeff. BIGGERS: Certainly. Thanks for having me.